As a mother and environmentalist, Laurie David knows that healthy and sustainable eating practices start at the dinner table. 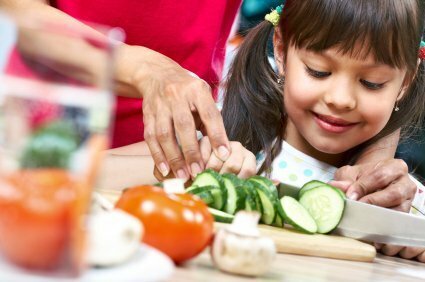 In this Nourish Perspective, she talks about why family meals are essential for children’s health, growth, and emotional development. Check out Laurie’s book The Family Dinner: Great Ways to Connect with Your Kids, One Meal at a Time to discover tips and recipes for making family mealtimes matter. You can explore more ideas from Nourish in Bryant Terry’s Cooking Together and Dr. Nadine Burke’s Food and Family. Why are family meals important for children’s health and wellbeing? Laurie David: There are many benefits in the simple act of sitting down to eat dinner together. Kids get better grades in school, are less likely to do drugs, and develop healthier eating habits. Family meals provide deep emotional benefits. They boost self-esteem and resiliency, and the ritual gives children a sense of safety and normalcy. It is a consistent place where they have access to their parents, and their parents have access to them. When you make the table a treasured place, you are sending a message to your loved ones: This time together—to share food, laugh, and talk—is sacred. From a health perspective, only when we cook for ourselves do we really know what we are eating. If all your meals come from take-out, restaurants, or the processed food aisle in the grocery store, you can be pretty sure the food is higher in fat, sodium, and sugar. Sharing family meals gives parents the opportunity to teach kids how to eat well, what size portions to take, and manners.